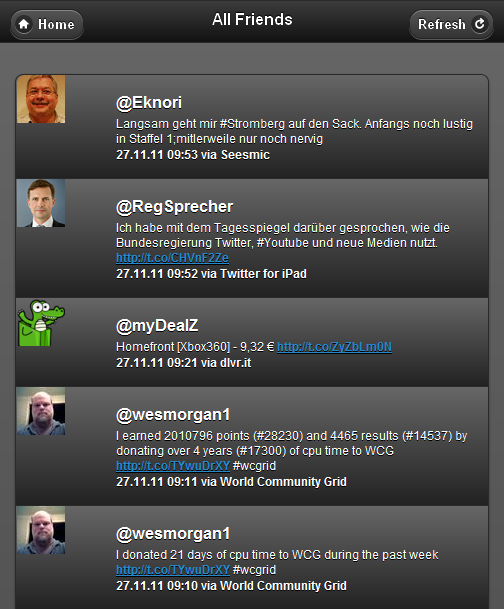 XPages Twitter Controls go Mobile! 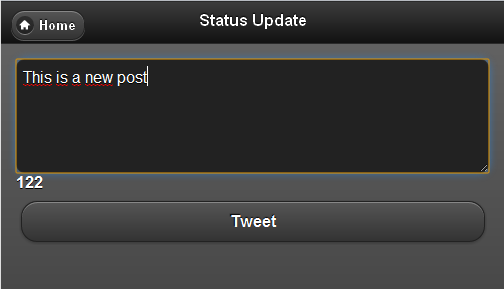 Last week I blogged about my Twitter Controls which I handed in to the 2. XPages Development Contest. 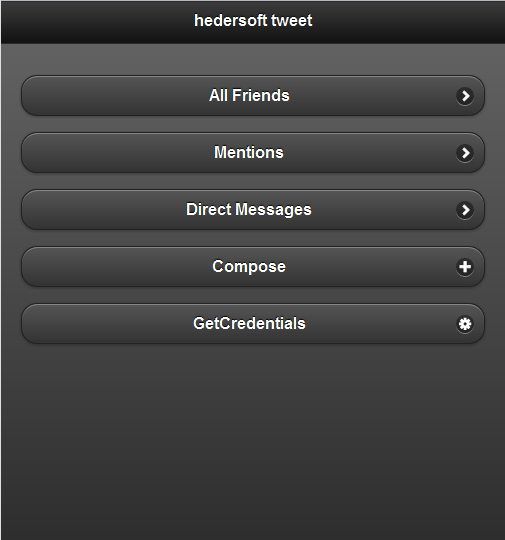 It fulfilled the requirements of the contest by being a social app that uses the Twitter API and OAuth for authentication. One component was missing though: MOBILE. So I sat down and checked the possibilities to make the app run on smartphones. There’s DOJO and the Mobile Controls integrated in the Extension Library 8.5.3. I took my first shot and had a mobile application together which pretty much has the same functionality as the web app in no time. 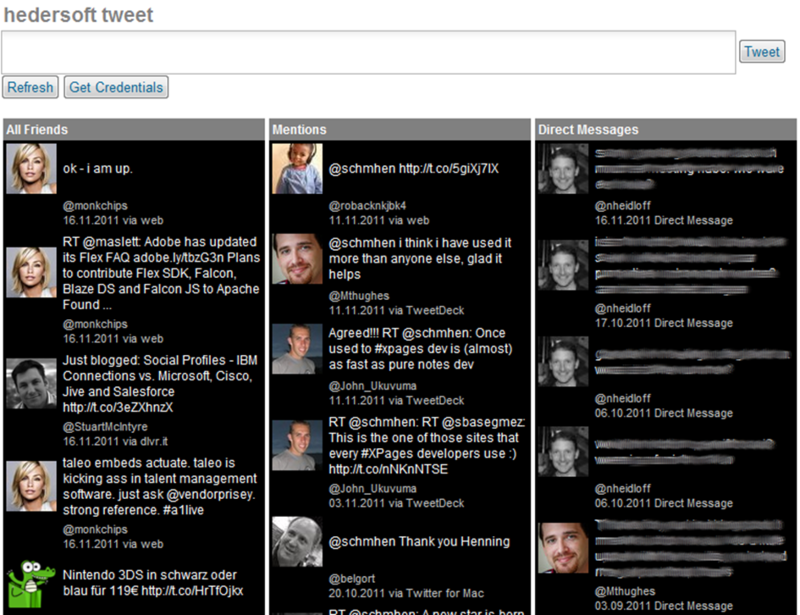 Then I checked jQuery Mobile which seems to be used by most of the developers out there. I toyed around with it for a while and put together an app based on jQuery Mobile that provides the same functionality as the web app – awesome! 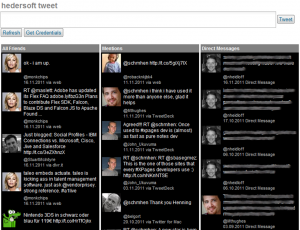 I named it hedersoft tweet v1.1 and uploaded it to openNTF. UPDATE: Niklas created a new video showing the controls in action. Watch it on XPages.info or download it from the contest page. Congratulations to all of you and enjoy your iPads! I reckon the contest can be regarded as a big success. I enjoyed a nice night before the contest started on which Niklas told me about the contest and what he expected from it. He said that if 10 controls will be submitted the contest is a big success. Well let’s check the numbers: We have 54 custom controls and 10 library controls. That’s 64 controls! That is 6.5 times more than expected. I assumes that Niklas spread numbers that were agreed on in the steering committee. So to OpenNTF: Congratulations as well! Now, let’s talk about the controls themselves. 64 controls are awesome, but what kind of controls are we talking about? There were all kinds of controls! We have very simple ones like the Daily Dilbert Control by Ulrich Krause or the Stop Watch Control by Rolf Kremer just to name two. On the other hand there are very sophisticated controls like the three winners or the Select Database Control by Lars Buntrock and the View PickList Control by Mark Hughes. There are many more so please do not blame me if you are not mentioned here. Now that the contest is over and the winners have been named I think the goal of the contest has been too broad. The variety of the controls is so big that comparison between the controls is not possible in all cases. The next contest should have a challenge more narrow like „Provide custom controls which implement Lotus Notes functions“ or „Provide custom controls which implemet interfaces to Third Party products“. It has to be narrowed down to make it more compareable and judgeable. Anyway, I personally expected Mark Hughes‘ View PickList Control among the last three. Why? Because it has an immediate business impact and everybody needs it. But don’t get me wrong: I do not want to kick one of the winners from the podium, the y definitely deserved to win. It’s just that if I had the chance to vote Mark would have definitely got an iPad. So, after the contest is before the contest, isn’t it? The community is the biggest winner anyway and benefits from all those controls handed in. So please let many more contests follow. XPages Dev Contest – a big success so far! Everybody already heard about the Xpages development contest on openNTF.org, right? Now here is a little summary of the weeks behind and a look forward to what can still be expected. See the full list of controls on xpages.info. So this is to all developers out there: The chance to win one of three iPads has never been higher! Sit back, generate some ideas and start coding custom controls. You don’t know how yet? There are a lot of sources on the web about xpages and custom controls. There’s also the brilliant „Mastering XPages“ book.